Conservation Officer Sgt. Cynthia Mann with mussel-sniffing dog Major. The fight to keep B.C. free of invasive mussels just got a major boost with a second mussel-sniffing dog ready to hit the inspection stations this spring. Conservation Officer Sgt. 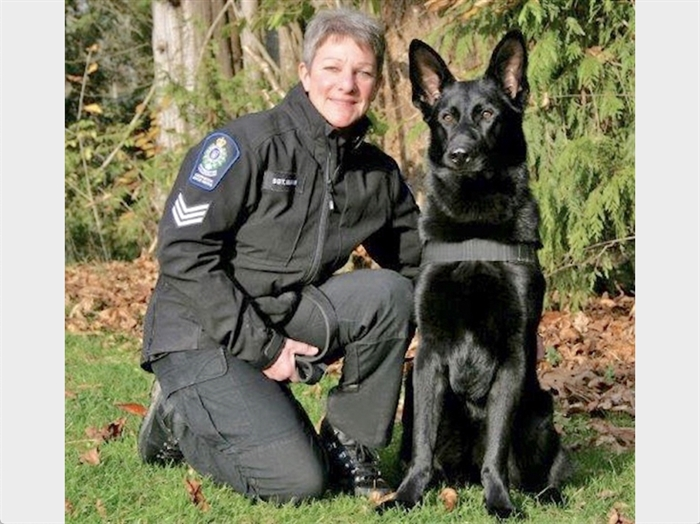 Cynthia Mann, who is based in Nelson, spent five weeks last fall being trained, along with a German shepherd named Major. They will be hitting the road between now and October trying to keep zebra and quagga mussels from ruining beaches and lakes. She joins Sgt. Josh Lockwood and his dog, Kilo, who is based in Kelowna in the growing program. The mussels also remove calcium from the water which disrupts the food chain and can damage water intakes and hydroelectric projects. It’s estimated the economic cost of mussels getting into B.C. waters is $43 million a year, and that doesn’t include the environment damage. So, $25,000 to train her and Major, pales in comparison. The mussel inspection program launched in 2015. Last year, 40,000 boats were inspected at 12 inspection sites, mostly in the Interior, Mann explained. Those inspections found 25 watercraft containing mussels so they had to be decontaminated. Most were at border crossings from the United States and major routes from Alberta. Provinces and states bordering B.C. don’t have mussel infestations but boats travelling from further east can carry mussels. So far, there are none in B.C., she said. 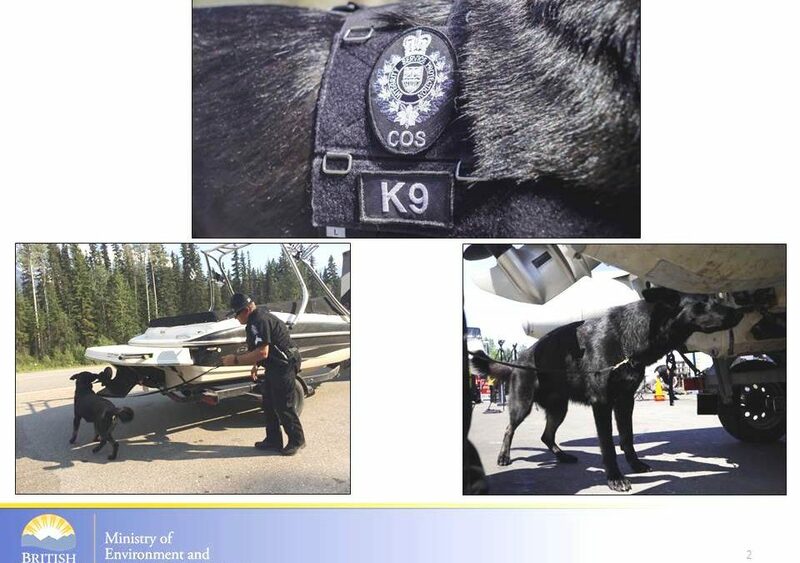 Twenty of the inspections were the result of notifications from Canada Border Services or other agencies. Two were detected by Kilo. The dog was based in Kelowna so he could travel from Surrey to Golden but with 900 inspections last year, that was just too much work for one dog and one handler. Major will focus on the Kootenays while Kilo will mostly be assigned to the Okanagan and Fraser Valley. Both will take turns travelling to Golden. Along with a third Sergeant in Golden, the Invasive Mussel Defence Program will be aided by 64 inspectors. While the human inspectors are trained to spot the mussels, the dogs can detect them in darker areas. He has a goofball personality and a knack for detecting unusual smells like bear gall bladders, firearms, shell casings, zebra and quagga mussels dead or alive, she said. “He just goes nuts when he makes a find,” said Mann. While the two are always together, Mann stressed they are partners. Mann said boaters who come from infested areas are generally well aware of the problem and may even request an inspection or seek out information about safe ways to bring boats from Alberta to B.C. Anyone wanting to report boats that may be infested, or other poachers or polluters, can call 1-877-952-7277. — This article was corrected March 21, 2019 at 12:15 p.m. to clarify the program started in 2015 and that there are no mussel infestations in Alberta. To contact a reporter for this story, email Rob Munro or call 250-808-0143 or email the editor. You can also submit photos, videos or news tips to the newsroom and be entered to win a monthly prize draw.